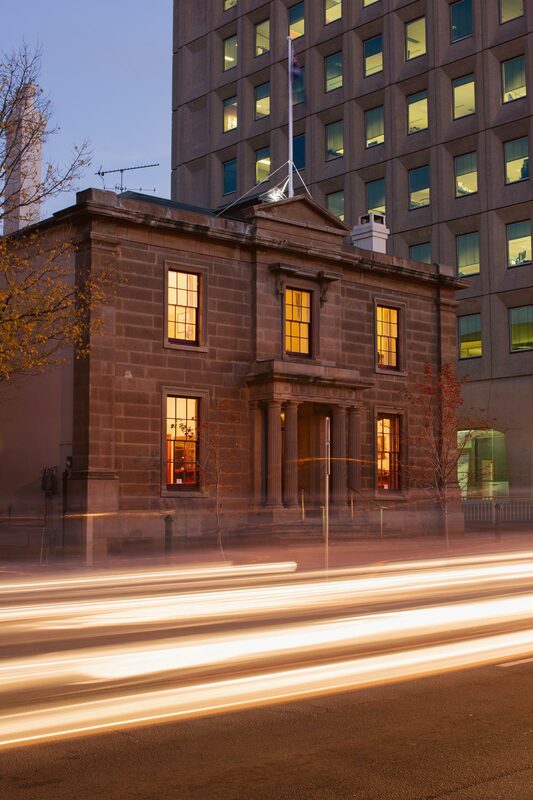 The Club was founded in 1861, when 70 gentlemen met in Hobart to form the Tasmanian Club. Rooms were leased in John Webb’s Murray Street catering and confectionery establishment, which became the present Hadley’s Hotel. It was founded on the London-style of Clubs where prospective candidates were elected by ballot by the current Members. In April 1873, the Club moved to its present location of 132 Macquarie Street. The Club building was built in the Georgian architectural style in 1846, originally as the Derwent Bank for Captain Charles Swanston to a design of architect James Alexander Thomson. A Billiard Room, designed by leading architect Henry Hunter, was added in 1873 and the Club house continued to be leased until offered for sale by the estate of the late John James at auction in 1886. The Club made a successful pre-auction bid of 4250 pounds. The same year the parcel of land occupied by the former Barley Mow Hotel, situated immediately behind the Club, with a frontage on to Davey Street was purchased and the two sites combined. After discussing several options, which included purchasing the Royal Tennis Court and building a new Club House adjacent to it, major improvements were approved based on an original concept of Henry Hunter. The concept was expanded with architectural plans for the larger site by architect, Robert Huckson and these extensions were constructed during 1889 and 1890. These extensions provided Members with a magnificent Dining Room and upstairs bedroom accommodation. A Grand Ball was held in August 1890 to celebrate the opening. Expenditure on the new building, alterations to the old one, together with furniture and fittings amounted to 6,792 pounds.